[PRESS RELEASE] Denver, Colorado, May 6, 2013… Without relying upon a single superpower, Breckenridge Brewery of Colorado will unveil its latest concoction, “The Caped Brewsader” – the official 2013 Denver Comic Con beer – this Thursday, May 9, at Punch Bowl Social at 7 p.m. The limited edition Belgian Witbier was specially crafted for the Denver Comic Con event, a three-day comic book and sci-fi convention slated May 31 through June 2. The Caped Brewsader is a Belgian Witbier (wheat beer) brewed with an ancient citron plant fruit called Buddha's Hand. This tropical fruit is segmented into finger-like sections, resembling the hand of Buddha. The result is a slightly hazy, crisp and refreshing ale that has a subtle citrus flavor perfect for summer enjoyment. 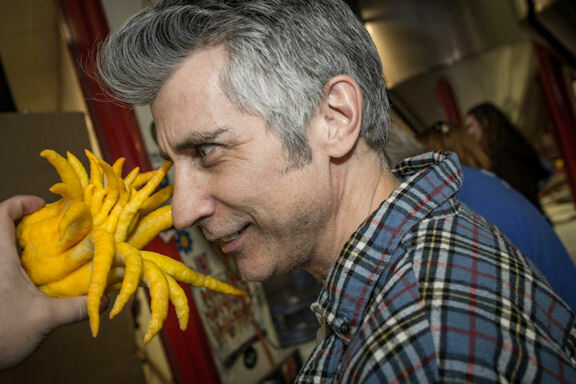 Approximately 40 pounds of Buddha’s Hand was added to the 100-barrel batch of beer. The idea for this year’s beer sprouted when Breckenridge Brewery staff met with Comic Con co-founder Charlie La Greca and his team. On the day of the brew, the Denver Comic Con team came to Breckenridge Brewery to assist with the brew. They were able to mill in malt, cut up, prepare and add the fresh Buddha’s Hand and hops. The beer’s name, “The Caped Brewsader,” was selected from more than 300 entries in a Denver Comic Con online naming contest. More than 15,000 voters helped select the beer’s winning identity. Renowned Australian comic book artist Ben Templesmith, known for his work on “Fell” and “30 Days of Night,” designed the label, pint glass and tap handle art. Templesmith is a New York Times best-selling artist and writer who has garnered numerous honors and awards in his industry. 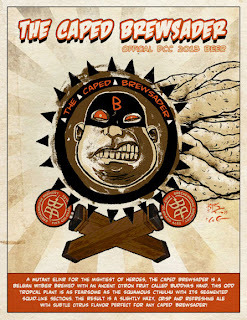 The Caped Brewsader debut party at the Punch Bowl Social, 65 Broadway in Denver, will begin at 7 p.m. on May 9, and the first 200 guests to arrive will receive a limited edition commemorative pint glass designed by Templesmith. Breckenridge Brewery will be providing samples of The Caped Crusader and special giveaways. Following its launch at the Punch Bowl, the beer will be served at the Denver Comic Con as well as at numerous restaurants and bars throughout the Denver area while supplies last. For a complete list of locations click here. This is the second year Breckenridge Brewery has sponsored the Denver Comic Con event, a three-day extravaganza May 31 through June 2 at the Colorado Convention Center. The event covers the world of comic books, film and related media. It is a fundraiser for Comic Book Classroom, a charitable organization that teaches children in underprivileged schools how to read through comic books. The Caped Brewsader will be served throughout the event, and Breckenridge Brewery will be on hand providing a photo booth, superhuman activities and Caped Brewsader comic booklets. For more information on The Caped Brewsader, visit www.breckbrew.com. Denver Comic Con is a three-day Fan Convention featuring the best in popular television shows, movies, Japanese animation, CosPlay, toys, gaming, sci-fi/fantasy and comic books. Every ticket purchased helps educate children in socioeconomically challenged communities in Colorado by providing an accredited after school program for students to learn to read through comic books. For more information visit www.denvercomiccon.com. - Breckenridge Brewery joins forces on WORK Collaboration Brew. - Breckenridge Brewery chooses its new Colorado home.